I have reached a milestone: as of this weekend, I have 100 blog followers! And most of them aren’t friends or family, which is what really blows my mind. I’m so tickled and flattered that so many people enjoy my posts enough that they want to see them regularly! To all of you following me, I say a hearty THANK YOU!! You encourage me to keep this little adventure going and help me believe that maybe I can really call myself a writer. That’s not the only bit of encouragement I’ve gotten either. I have a new follower on my Etsy page, and again, it’s someone I’ve never interacted with before. Of course I love to have my friends and family follow me, but when it’s a stranger, you don’t question the motive. You know it’s because they honestly like your page. And that feels good. My Facebook bonny knits page is at 72 likes, so it’s a slow grower, but that’s okay. It’s grown by almost ten likes within the last couple of weeks; that’s encouraging. And I’m hoping that after Christmas when I have more time to put into my business, I can get that number higher too. Okay. Enough with the boring number stuff. I’ve been productive the last few days and have several things to show off. They’re all Christmas gifts, and there’s a slim chance one of the recipients *might* see this blog, but oh well. 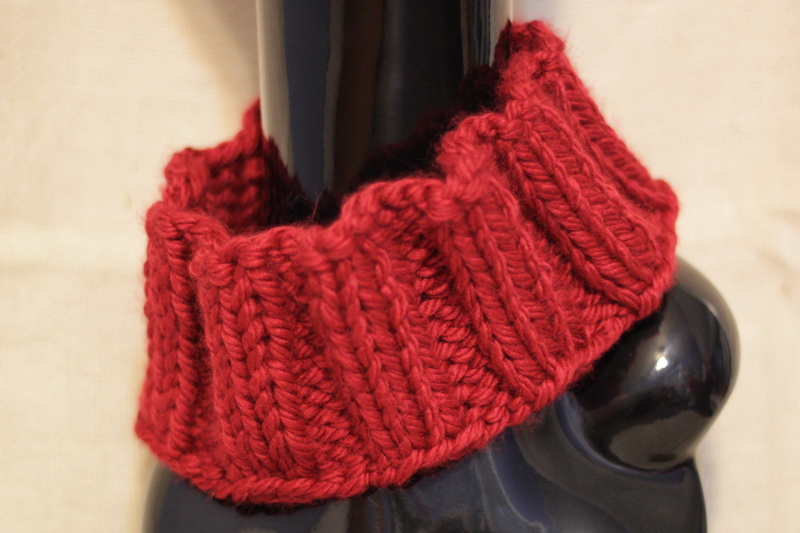 First is a simple cowl, made to hug the neck closely. It’s modified from this headband pattern. But I honestly don’t remember now how many stitches I cast on, and apparently I didn’t create a project on Ravelry. I *think* I did 60 stitches on size 13 needles, and I just did a simple 3×3 rib until it seemed big enough. It came out a little looser than I intended but I think it will still please the recipient. I used Lion Brand Hometown USA, a thick, warm yarn, in Tampa Spice. Now a hat! Another hat, hooray! I love how this came out. It’s for one of my nieces and she saw something similar in a Delia’s catalog, so this is my attempt to recreate it. I especially like the big pompom on top. 🙂 This was my first time using a Purl Soho pattern, even though I’ve been admiring them for ages. It’s the Super Soft Merino Hats for Everyone. I didn’t have the right size needles so I did the men’s size on smaller needles. I think it came out perfectly. The gray is Cascade Pacific Chunky, an acrylic/merino blend. It’s a yarn I just found recently and it’s a new favorite. The light turquoise is Tuhu by Mirasol Yarns and oh my is it luscious. It’s 50% Llama, 40% Merino, 10% Angora. My SIL bought it and started knitting boot cuffs, and discovered she’s extremely allergic to the angora. It’s sad. But her loss was my gain: I bought the yarn from her and it was heavenly to knit with. I held it double to match the thickness of the Cascade, and I *think* have just enough left to make a pair of the 75 Yard Malabrigo Mitts to go with the hat. Fingers crossed! 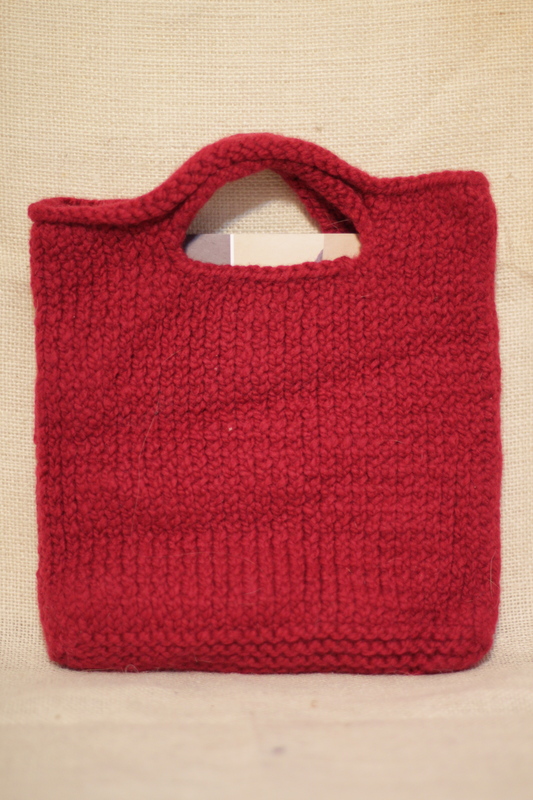 Last one: the Lucky 7 Felted Tote. I realize it’s not felted yet. This is what it looks like after two cycles in my washer. I think I have determined that my washer just doesn’t felt. There’s no center agitator, so the wool doesn’t get enough action. (haha!) 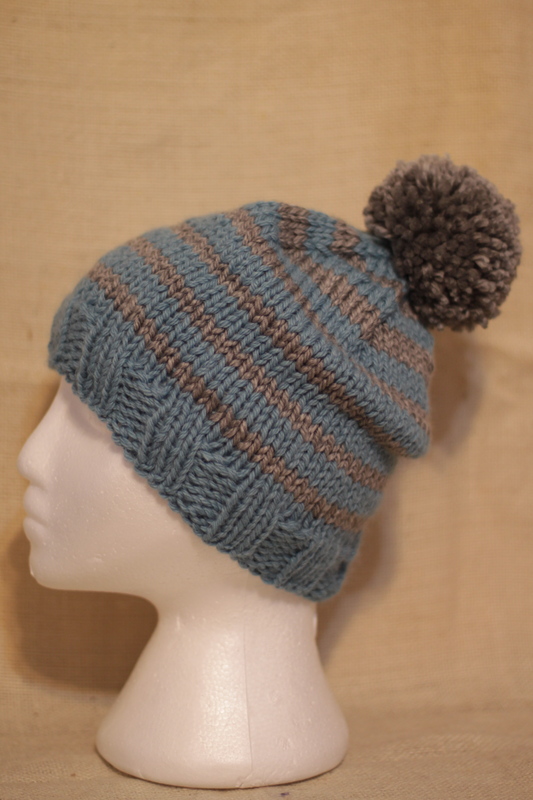 This is made with Cascade 128 Wool. The label said nothing about superwash, so it really should felt. Today I will submerge it in hot water and beat it with a wooden spoon. Tune it tomorrow to see how that goes!